Land managers: N.C.Wildlife Resources Commission, U.S. Army Corps of Engineers. Note: Some or all of this trail is on gamelands and hunting is allowed. Learn about local hunting seasons here. Trailhead/Access: Elbow of Jimmy Rogers and Little Rogers roads, and Cheek Road. Click on map below for specifics. A lengthy boardwalk leads from the Little Lick Creek bridge to land. 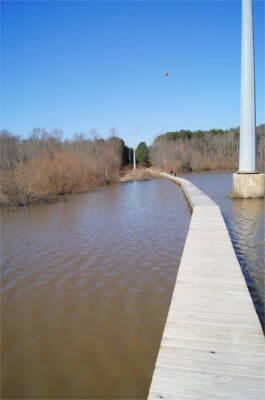 Technically, this section begins in the middle of the Little Lick Creek Bridge, but since there’s no parking at the bridge — which, combined with 100 yards of lead-up boardwalk, spans not just Little Lick Creek, but a wetland that is often submerged — you begin at roadside parking at the elbow of Jimmy Rogers Road, west of the bridge. You must backtrack a quarter mile or so to get to the bridge, but it’s worth it, for here you’ll find a rarity on the Piedmont portion of the MST. Gregory Scott, the Friends of the Mountains-to-Sea Trail volunteer who oversees maintenance of Section 13, explains. The “enclosed” part of this stretch of trail is nice as well. Section 13 is more moderately rolling than you’ll find elsewhere along the lake. The tread is smoother, devoid of the rocks and tree roots that characterize a Falls Lake hike. That and the distance make this stretch especially attractive to trail runners. Geology Highlights: Prominent lakeside bluffs of sandstone, good views of the lake with features related to the Neuse River, and a horizontal slab (sill) of diabase are all encountered along this trail section.